My TomTom Sat Nav usefully prompts you with the speed limit for the road you are driving on, and although they have a disclaimer saying that the accuracy for being up-to-date cannot be guaranteed, I have noticed that all UK motorway and dual-carriageway slip roads and any interconnecting roads, whether they are single or dual-carriageways, are indicated to be 60mph. I would have thought that the speed limit for slip roads and interconnecting dual-carriageways (e.g. road connecting M3 to M27) would be the same as the speed limit for the motorway, which in the case of cars, motorcycles, car-derived vans and dual-purpose vehicles, is 70mph (when not towing a trailer, other vehicle or caravan). I have always believed that The Highway Code is the go to for the laws regarding driving within the UK, yet the page on Speed Limits does not answer the question. What is the situation within the UK? 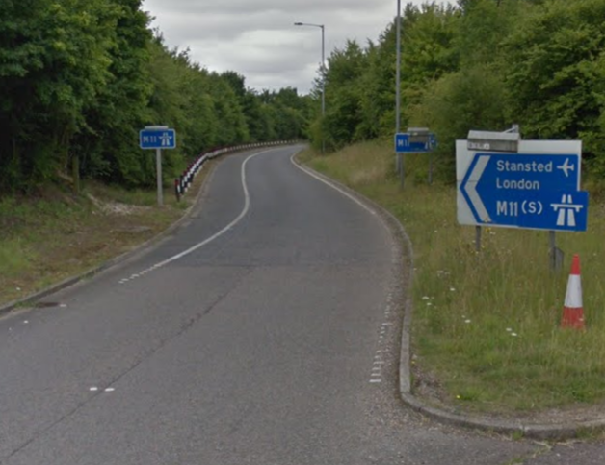 On entering the M11 southbound slip road from a roundabout on the B184, there is immediately a pair of blue signs saying M11. According to the Highway Code they indicate the "start of motorway and point from which motorway regulations apply". Since you are now on a motorway and there is no other speed restriction, the limit for cars etc from this point is 70mph as shown in your Highway Code reference. 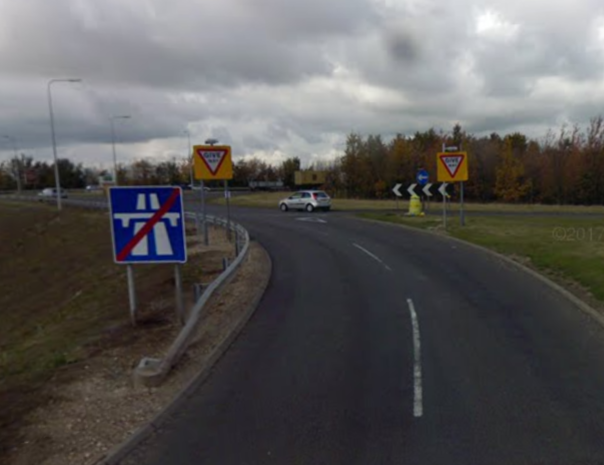 Similarly on leaving the M11 at J10 northbound, the "End of Motorway" sign is at the far end of the slip road, just before the roundabout at the A505. Also the interconnecting roads between motorways do not have any "End of Motorway" signs. Short summary: There is not a universal speed limit on UK slip roads. While in general the national speed limit for motorway applies, if there is a speed limit sign stating otherwise you should follow that instead. You MUST NOT exceed the maximum speed limits for the road and for your vehicle (see the speed limits table). This means in general, the motorway national speed limit applies on slip roads (given it under motorway restrictions, see @Weather Vane's answer). However if there is a speed sign installed that indicates otherwise, that would be the actual speed limit. The speed limit of the motorway you are joining (e.g. this slip road joining M32 in Bristol has a speed limit of 40mph, that on that particular stretch in M32. Not the answer you're looking for? Browse other questions tagged uk driving or ask your own question. Do any States in the US give traffic tickets for 5 mph above the speed limit? What's the actual speed limit on highways in California? Where is the exact end of the speed limit zone for California roads/highways? Are there speed cameras on stretches of the Autobahn with a temporary speed limit?